By posting this recipe I am entering a recipe contest sponsored by The Mushroom Council and am eligible to win prizes associated with the contest. I was not compensated for my time. Looking for ways to stretch your meat to save money? Wanting to find ways to boost the nutrition of your recipes? Mushrooms are your answer. Mushrooms have a depth of earthy flavor and meaty-like texture that pairs beautifully with meat and can even substitute for it. The Trend is to Blend is a catchy way to remember the blendability technique of blending mushrooms into recipes. Adding mushrooms allows you to use less meat which is beneficial for a variety of reasons such as saving calories, fat and money. In addition, mushrooms boost flavor and nutrients like B vitamins, potassium and vitamin D. I often mix mushrooms into meat in lasagna, spaghetti and my Spring Onion Casserole. 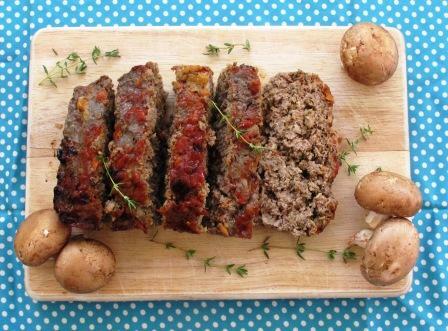 Meatloaf is great comfort food and quick to throw together. I’ve made a number of different versions, sometimes with turkey and sometimes with beef. One of my favorites has a touch of horseradish and a little bit of cheese mixed inside. So naturally I had to create my own version using mushrooms and other carrots. My husband and kids declared it a winner. I used a loaf pan, but it could easily be made into mini-loaves or “muffins.” Next time I’ll probably cook it in my slow cooker so I don’t have to heat up the kitchen with the oven. Blending in mushrooms helps boost the nutrition in recipes as well as stretch the meat to save money. In a large bowl, mix together the ground beef through the cheese. Add 1 tablespoon of the ketchup and mix well. 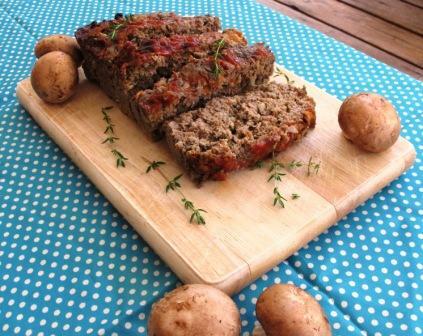 Place the meat mixture in a greased loaf pan. Spread the remaining ketchup on top of meatloaf. Bake for 30-35 minutes or until cooked through and internal temperature reaches 165 degrees F.
Use a food processor to finely chop the vegetables for speedier preparation. If you don't have a loaf pan, you can form into a loaf and cook on a jelly roll pan. A slow cooker could also be used for prepping early in the day and cooking on low for 6-8 hours. You can enter your own recipe into the Swap It or Top It contest for a chance to win $5000.